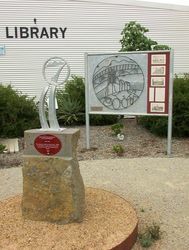 The sculptured memorial commemorates and reflects the 17 lives lost and the devastation of the Lara Bushfire of the 8th January 1969. The bluestone plinth and plaque were dedicated on the 11th January 2009 to commemorate the fortieth anniversary of the devastating fires. 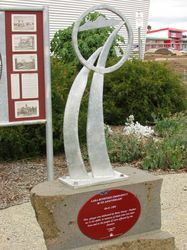 The plinth and plaque containing a symbolic sculpture are incorporated into the memorial which was unveiled in 2010. 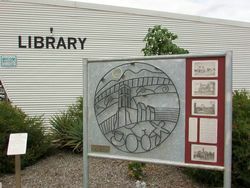 The memorial also contains six stainless steel plaques mounted on a deep red background on a sculptured interpretive panel which narrates the devastation in the aftermath of the fire. 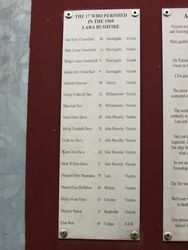 Four photographs show significant landmarks and two text plaques tell the story and list the 17 people who perished in that fire. 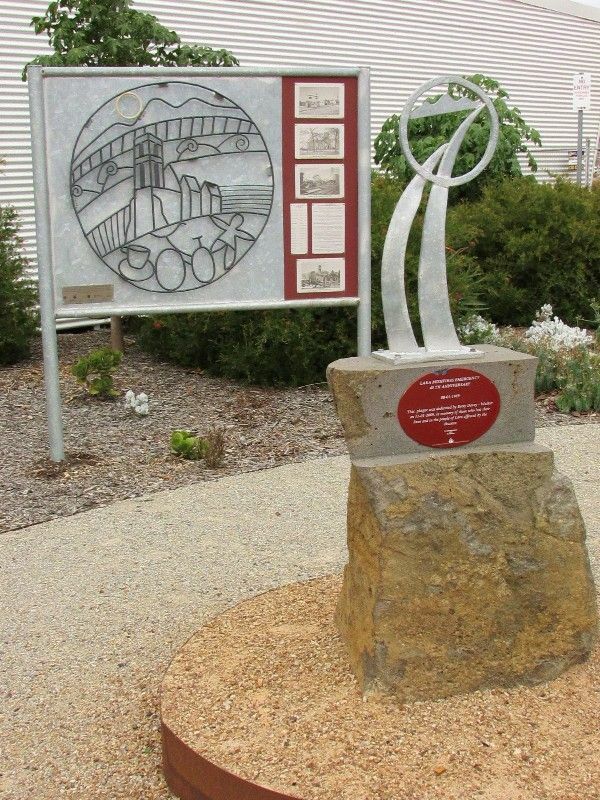 The final plaque gives a brief background to the memorial project and links to the enamel plaque on the bluestone plinth supporting the grass sculpture. On the 8th January 1969, 280 fires broke out in Victoria. Of these,12 grass fires reached major proportions and burnt out 250,000 hectares. Areas seriously affected included Lara, Daylesford, Dulgana, Yea, Darraweit, Kangaroo Flat and Korongvale. Twenty-three people died, including 17 motorists at Lara, trapped on the Geelong to Melbourne freeway. The fires also destroyed 230 houses, 21 other buildings and more than 12,000 stock. 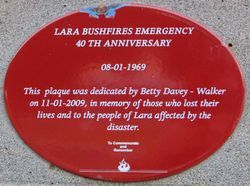 This plaque was dedicated by Betty Davey-Walker on 11 - 01 - 2009, in memory of those who lost their lives and to the people of Lara affected by the disaster. 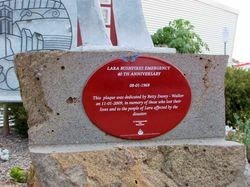 This memorial to the 1969 Lara Bushfire was unveiled on November 14 2010 by Betty Davey-Walker, bushfire survivor, local identity and instigator of this project. 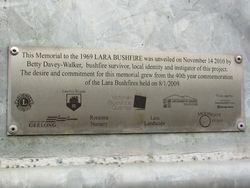 The desire and committment for this memorial grew from the 40th year commemoration of the Lara Bushfires held on 8/1/2009.